Introducing the XLe and XLt Operator Control Station (OCS) , an "all-in-one" controller, small enough to fit in the palm of your hand (only 3.75" square). These are more than just a PLC, they include a Graphical Operator Interface (HMI), built-in I/O, networking and removable mass data storage. OCS is a robust, reliable control product that combines a traditional controller (programmed with ladder logic) with an operator interface, I/O and networking into an integrated, all-in-one unit using a single industry-recognized software package called CscapeTM. 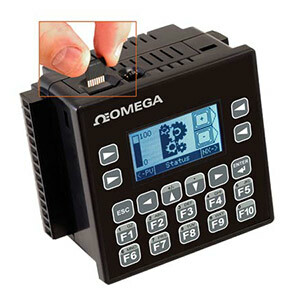 --- The HE-XL series has a 320x240 TFT color touchscreen with 5 function keys. The XLe is the first industrial product to include support for the latest standard in removable mass storage. To date, this dime-sized memory is only found on video-enabled cellular phones and is available in densities ranging from 128 MB to 2 GB. This is ideal for storing process data, machine recipes, and application files. Users can easily update the application program through this memory device allowing logic and screen updates to be made in a single step with transportable media. The four available XLe and XLt models with built-in I/O include digital, analog and high speed I/O. For machine control, the high speed I/O can provide totalizing, frequency measurement, PWM generation and pulse outputs. The available universal analog I/O is ideal for process control applications with high-resolution inputs which can be configured for thermocouple, RTD, 4 to 20 mA, ±100 mV, and 0 to 10V signals. The XLe and XLt also have field installable communications options. An internal 10/100 MB Ethernet card makes machine data and XLe programming accessible at a plant-wide or world-wide basis. In addition, the XL Series is available with an internal 57.6k telephone modem card. While Ethernet and modem are optional, dual RS232/RS485 serial ports and an integrated CAN-based network are standard. XL Series I/O expansion is not limited to its built-in I/O. as well as relay outputs. allows seamless communication between the computer and any controller. The HE-XE103 model PLC provides high-speed pulse outputs which can be used to drive any of Omega's step & direction stepper drives. The Cscape ladder logic software has built-in step motor functions which make programming your motion control application easy. The STM23S-2AN is an integrated stepper drive + stepper motor which accepts pulses from a PLC. Add the HE-XCK USB programming cable and OMPS150A24 power supply for a complete motion-control system that costs less than $1200. As a compact, powerful controller the XL series can be used in literally thousands of applications. From OEM machine control to machine monitoring in a plant environment, the XL series can be instrumental in keeping you or your customer’s automation activities running smoothly. Future expansion is not a concern, because the XL Series is part of the wide ranging OCS product line, programmable throughout with a single software package Cscape. The XL series is designed with an attractive, generic look so it will fit in with most panel or console designs. advanced temperature control and much more on any machine. a natural for packaging machinery of all types. are ideal for the agricultural environment. for pump control, tank monitoring and remote telemetry in general. Please note: All of the PLCs require the Cscape software (free download), a 12-24 VDC power supply, and HE500CBL300 programming cable (RS232). A USB programming cable is also available (HE-XCK). Programming cable is also included in HE-CPK software package. XLe Series OCS: All models have a PLC, operator interface, networking and I/O built-in. Controller has 256 KB of application memory and 1.2 mS/K logic scan. Operator interface features a 128 x 64 graphical display and 20-key keypad with function key and numeric entry capability. XLt Series OCS: All models have a PLC, operator interface, networking and I/O built-in. Controller has 256 KB of application memory and 1.2 mS/K logic scan. Operator interface features a 160 x 128 sunlight readable graphics display via a high resolution resistive touch screen, 4 function keys and a system key. XL6 Series OCS: 5.7' TFT color touchscreen with PLC, networking, and I/O. Controller has 256 KB of memory and 0.2 mS/K logic scan. Operator interface features a 320 x 240 sunlight readable graphics display via a high resolution resistive touch screen, 5 function keys and a system key. 注: Panel-mount hardware and user manual included.